Kenya: Sea-Level Rise and Impacts in Africa, 2000 to 2100. Application of the DIVA model to Africa. 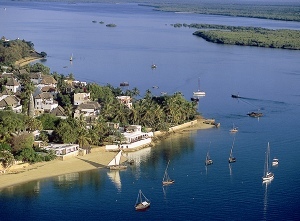 Kenya has a 1,586 km coastline consisting of mangroves, coral reefs, sea grass, and rocky, sandy and muddy shores. It has a coastal population of 1.8 million people (in 1990) (country’s total population, 37.5 million in 2007 (Times Book, 2008)). Tourism is a popular industry and is an important part of the economy (Oyieke, 2000). Mombasa, Kenya’s second largest city (the largest being Nairobi over 500km inland) with a population of 665,000 (in 1999) is growing rapidly and has many low-lying regions in the coastal zone where, together with three other neighbouring main towns of Lamu, Malindi and Kilifi, infrastructure, tourism, aquaculture and agriculture are undertaken, making these activities vulnerable to sea-level rise. It has the largest seaport in East Africa and with its two harbours (Kilindini and Old Port) has an important role in the national and regional economy. Hence, impacts of sea-level rise are likely to be felt beyond the coastal and national boundaries (Awuor et al.,2008). Areas around the Watamu and Sabaki river estuaries are reported to be the most vulnerable sites, although the low-lying areas are spread along the whole coast. With 0.3m of sea-level rise and without adaptation, it is estimated that 17% (4,600 ha) of the Mombasa district will be submerged (Oyieke, 2000). Improved irrigation planning further inland and other land anagement practices could be used for flood management and reducing runoff into the ocean, which could potentially contribute to reducing the impacts of sea-level rise (Awuor et al.,2008). In the Tana delta, based on present trends, about 400 people (about 7.% of delta population) would be at risk and 5.7% of the delta area (481km2) could be lost between 2000 and 2050 (Ericson et al., 2006; see Table 2). Under accelerated sea-level rise scenarios, the impacts would be greater. Is Nepal ready to receive the climate finance it requires?